Use this HTA version to convert between decimal numbers and Attic numerals. To convert decimal numbers to Attic numerals, just type a decimal number in the "Decimal" field. The "Attic Numerals" field will be updated while you type. 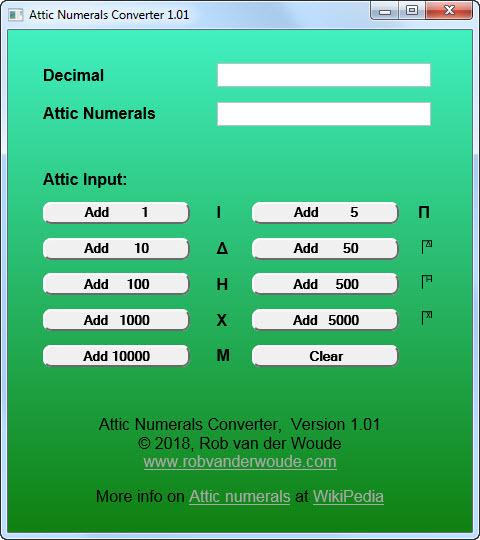 To convert Attic numerals to decimal numbers, you need to use the buttons to "type" the Attic numeral. The "Decimal" field will be updated while you type. To clear the "Decimal" and "Attic Numerals" fields, use the "Clear" button. Unlike most of my HTAs, this one does not come with an auto update feature. More information on Attic numerals can be found on WikiPedia. 1.01 2018-01-23 Minor changes to make the HTA more HTML 5 and CSS 3 compliant. 1.00 2016-01-31 First public release.